Today I went out to buy all the Christmas presents. I had already figured out what to buy, and I don´t buy that many because in my family it is a tradition only to give gifts to kids under 14 years old. I like that tradition, the presents are for the kids, the food and wine and getting a little bit of holiday vacation with family is for us grown ups. In Iceland, over Christmas, people eat a lot of fat food and VERY SALTY food. In between it is important to eat healthy food. I, in general eat healthy over Christmas, I do a little bit of the salty and fat with the pork on Christmas Eve. With all the fat and salt, a cucumber is a really nice treat. Cucumber goes so well with all kinds of food. It´s refreshing. With Mexican, Sushi, Indian, Icelandic, you name it. I find it essential in my taco (but not in burrito, only taco shells…) with all kinds of sushi, in Raita with Indian food and I love it sliced on rye bread with Icelandic lamb paté. I made this cucumber salad for a sushi party the other day. It´s simple and again, REFRESHING! 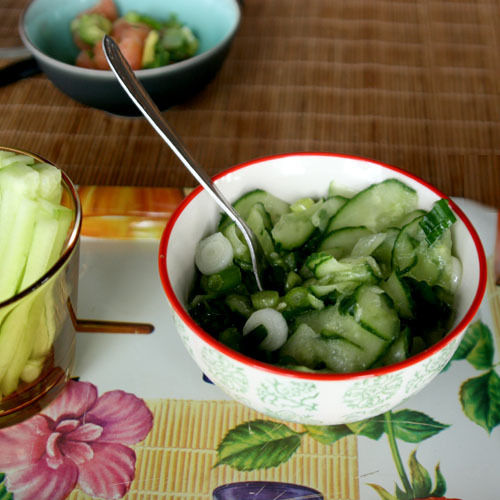 Cucumber is so refreshing and does cut the taste of fat in a meal. Also a wonderful addition even in a healthy meal…love the crunch.